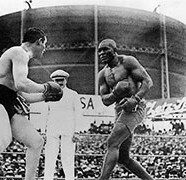 On this date in 1908, Jack Johnson became the first Black person to win the World’s Heavyweight Boxing title belt. Johnson was awarded the belt when police entered the ring to stop the fight. Johnson was winning the fight in an extremely lopsided manner and won via a technical knockout of Tommy Burns. He defended his title successfully, including against Jim Jeffries, a former heavyweight champion who was called out of retirement as the “Great White Hope,” but was knocked out by Johnson in the 15th round of what many called “the Fight of the Century.” Johnson, who lived a very extravagant lifestyle and engaged in romantic relationships with white women, was hounded by critics as well as law enforcement throughout his career. He was eventually arrested under the Mann Act for crossing state lines with a white woman who would later become his wife. Many believed this to have been a sham trial aimed at ruining his career and removing him from the national scene. He served a year in prison and died in an automobile accident in 1046. He was inducted into the Boxing Hall of Fame in 1954. Ten days after his group, “The Jimi Hendrix Experience,” released their first hit song in the United Kingdom, “Hey Joe,” Jimi Hendrix penned his biggest hit song, “Purple Haze.” It became his breakthrough hit in the United States and propelled him to stardom in the 1960s rock scene. After serving in the military int he United States, Hendrix moved to the United Kingdom where he was recruited by Chas Chandler, a former member of the group “The Animals.” After teaming with bassist Noel Redding and drummer Mitch Mitchell, Hendrix saw the groups star rise and Purple Haze helped to form his legacy as the greatest guitarist in rock history. On this date in 1966, Kwanzaa is celebrated for the first time in in Los Angeles, California. The seven-day holiday which has strong African roots was directed by Maulana Karenga, the chair of Black Studies at California State University at Long Beach as a celebration of African American family, community, and culture.